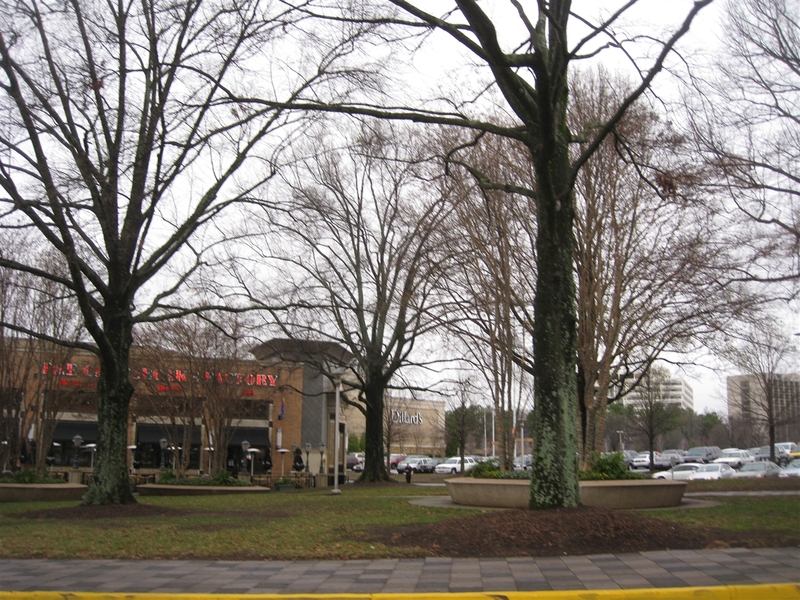 Our first Georgia entry, Perimeter Mall, is located in the wealthy north-suburban Atlanta community of Dunwoody. 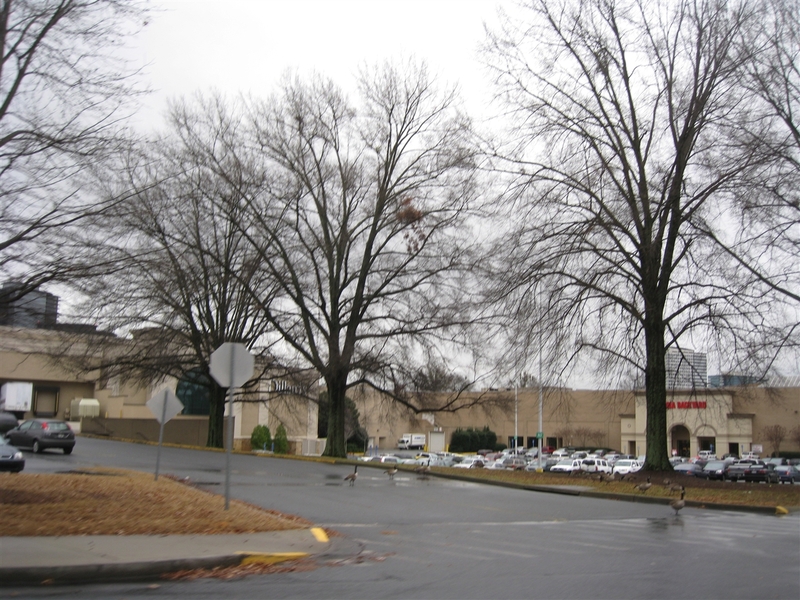 Opened in 1971, Perimeter Mall debuted as the fourth mall in Dekalb County, and the seventh mall in the Atlanta metropolitan area. Nearly four decades later, Perimeter Mall is one of metro Atlanta’s best shopping venues and offers the most upscale store roster of any mall outside Buckhead. Located just a few miles north of Buckhead and Midtown Atlanta, Perimeter Mall draws from a large area of the northern metro, from Roswell to Sandy Springs and into northern Dekalb County, and is the anchor to an area of office complexes, retail, and hotels located around the interchange of GA 400 and I-285. Ostensibly named after the 64 mile long Interstate 285 which circumscribes Atlanta’s perimeter, and at one time was the edge of Atlanta’s suburban extent, Perimeter Mall opened with only two anchors, Rich’s and JCPenney, in a dumbbell style layout with an enclosed corridor of shops connecting them. 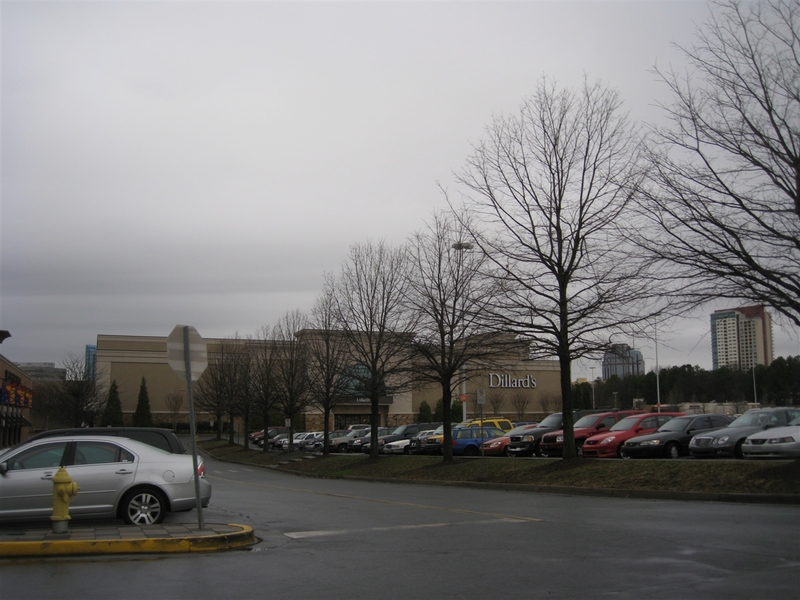 Throughout the 1970s, Perimeter Mall was very similar in design to another Atlanta mall, Greenbriar Mall, which is located in southwest Atlanta some 25 miles away; however, changing fortunes for both areas in the decades following caused the malls to become less similar as time went on. In 1982, the two-level Perimeter Mall was dramatically expanded to its current T-shape when a new northwest wing was added, ending at Atlanta-based anchor store Davison’s, which became Macy’s in 1986. A new food court was also added along this wing, and the wing nearly doubled the size of the mall at the time. Unfortunately, a terrible tragedy occurred at Perimeter Mall in 1990, as Calvin Brady, a mental hospital patient, opened fire in the mall’s food court at lunch time, killing one person and injuring four. 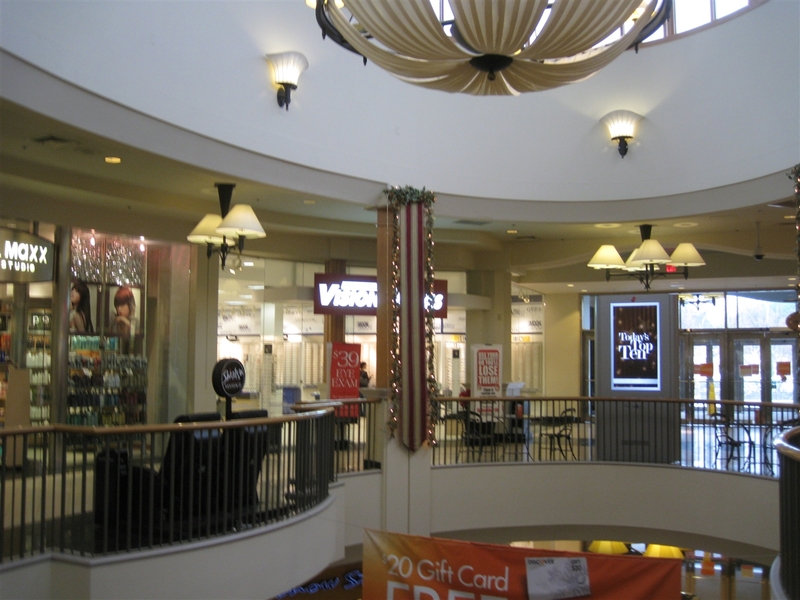 To keep up with newer competition like the large and successful North Point Mall which opened in 1993, Perimeter Mall was renovated several times from 1993-2000, and expanded once again in 1998. Throughout this period numerous anchor changes also occurred, shifting every anchor from its original place and introducing three new ones. A MARTA rail station also opened just in time for the Olympics in 1996 in the southwest parking lot, providing rail access from downtown Atlanta, Buckhead, and all other MARTA stations. In 1998, Nordstrom opened their first Georgia store next to Macy’s in the northwest wing, adding a short stub wing and several more stores in the process. 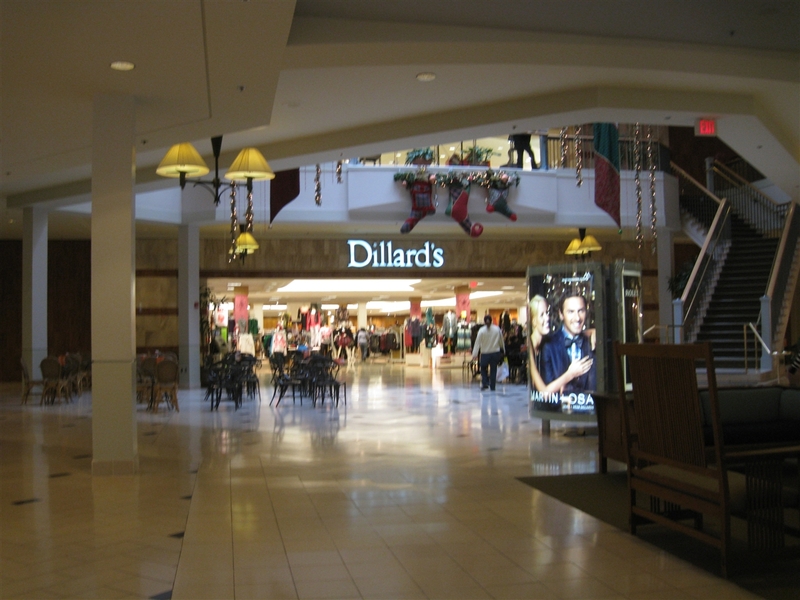 In addition, JCPenney closed in 2000 and its building was demolished and reconstructed for Dillards, which opened in 2005. Also, the Rich’s became Rich’s-Macy’s in 2003, and was converted to just Macy’s by 2005; meanwhile, the original Macy’s in the newer wing, which was originally Davison’s prior to 1986, closed in 2003 and reopened the same year as a Bloomingdales. Got all that? 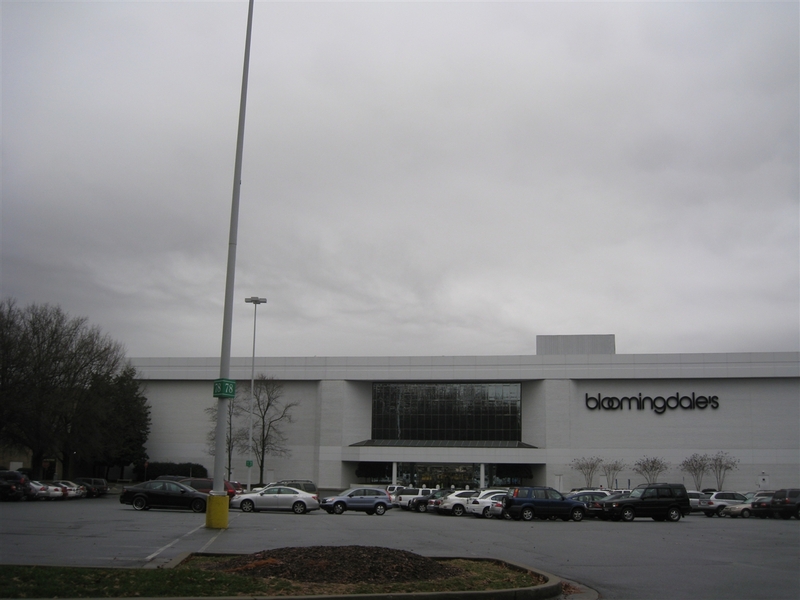 The opening of Bloomingdales was part of its entry into the Atlanta market, as Macys decided to introduce the Bloomingdales nameplate to two Atlanta malls rather than sell the anchors due to the Rich’s consolidation. 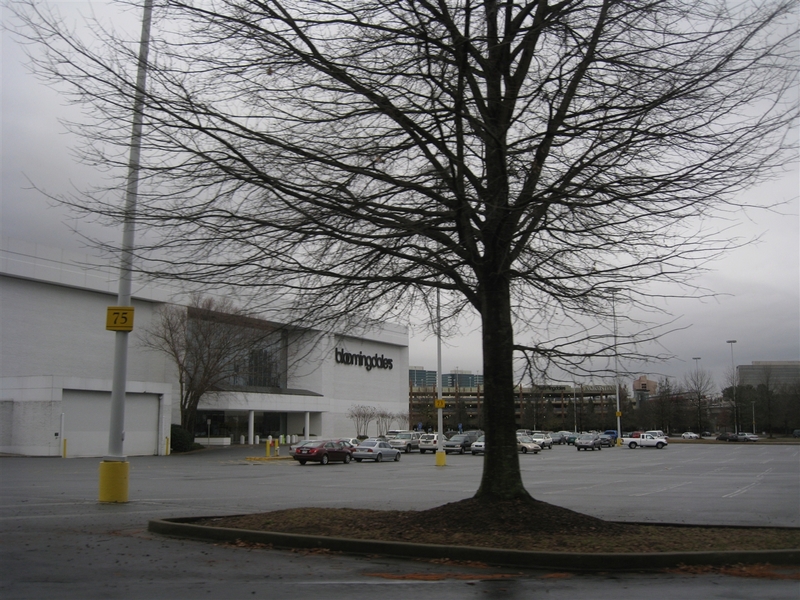 Both Perimeter Mall and Buckhead’s Lenox Square, where Bloomingdales also opened in 2003, were considered because of their demographics as both malls serve some of the wealthiest zip codes in the Atlanta area. One of the more recent renovations also brought a streetscape facade to the Ashford-Dunwoody Road-facing exterior, bringing new destination restaurants and outward-facing retail, a popular trend in malls these days, to Perimeter Mall. 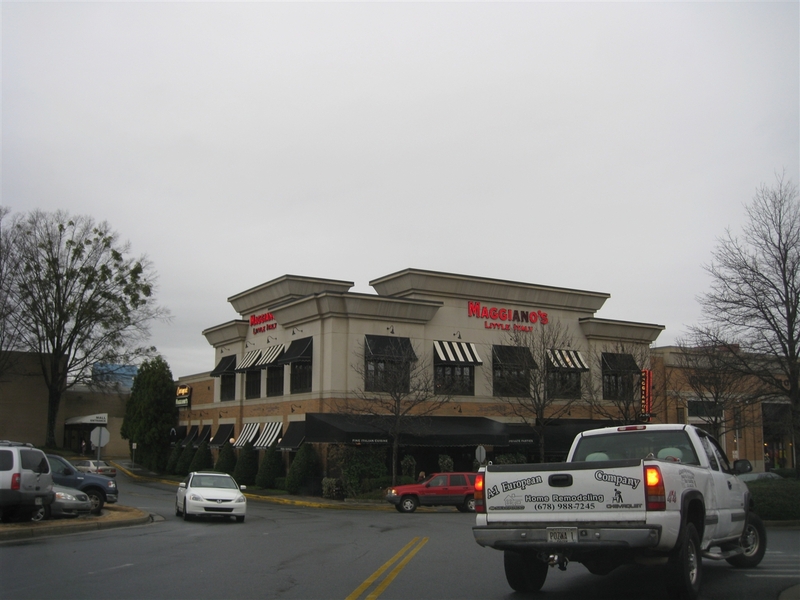 Today, Perimeter Mall has a solid foothold in the wealthy northern Atlanta market, surviving despite an onslaught of malls and lifestyle centers which have opened since 1990 throughout the metro area, like the nearby North Point Mall in Alpharetta which opened in 1993. Also, Perimeter Mall is only several miles north of metro Atlanta’s best malls, Phipps Plaza and Lenox Square, which are co-located in Buckhead across the street from one another. 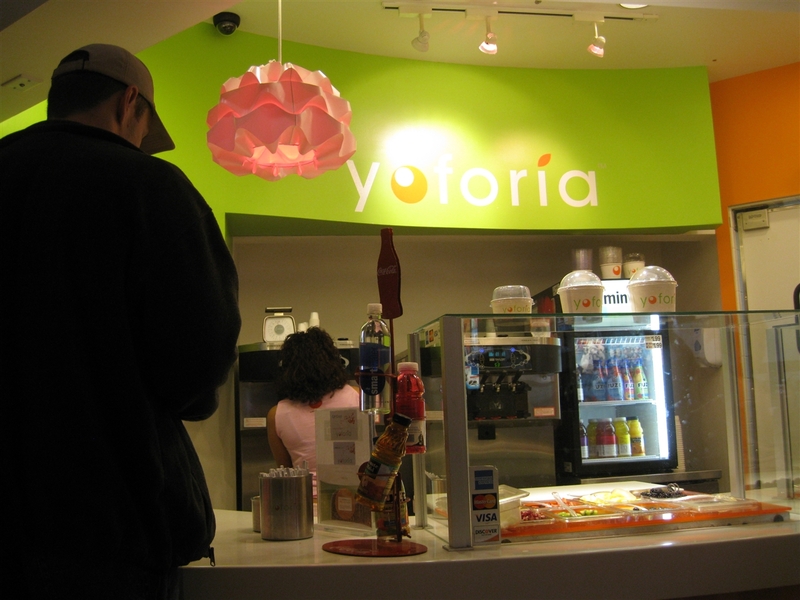 Perimeter Mall’s upscale and innovative roster of stores continues to woo Atlanta consumers, as recently the Yoforia chain, serving the latest big trend of frozen yogurt (a la Pinkberry and Red Mango) chose Perimeter as its first mall location. Perimeter Mall is the anchor of large retail complexes, office buildings and hotels near the interchange of GA 400 and I-285, and will continue to thrive in the near future unless GGP’s financial woes force its closure. 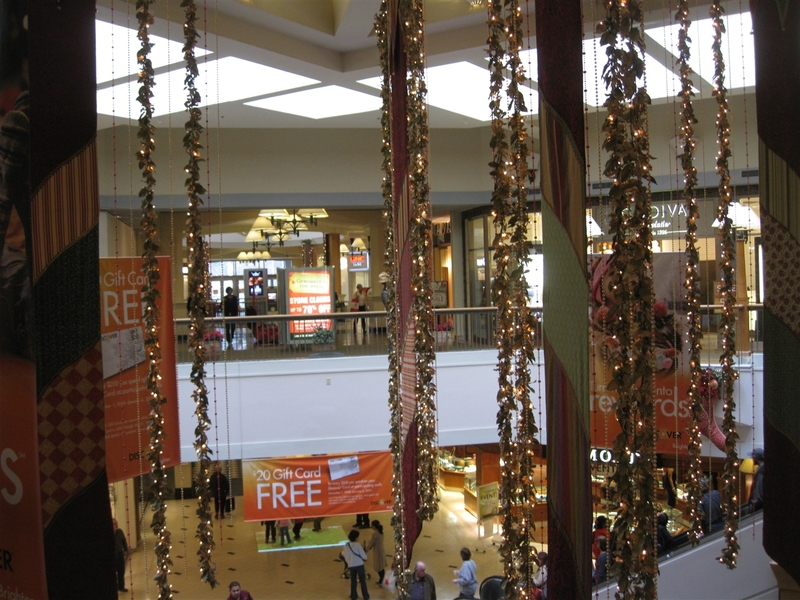 We visited Perimeter Mall in December 2008 and took the pictures featured here. Feel free to leave your own comments about the mall or experiences you’ve had. Gee, how old is the Skillz store? And why is it doing in an upscale mall? 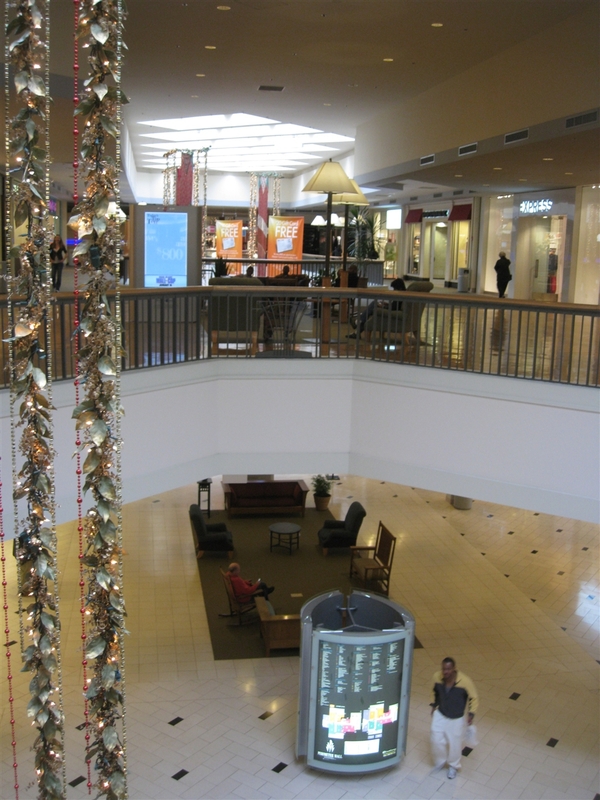 In many ways the most pleasant mall in Atlanta–it doesn’t have Lenox’s level of pretense or its awkward layout. Unfortunately, the traffic pattern around this mall, esp. North of it is confusing and it’s near the most congested section of I-285. Nice job! I actually do have pictures of the Rich’s prior to the changeover (unfortunately nothing of Davison’s or Penney’s). I grew up going to this mall…it was always one of the better malls in Atlanta, and I remember it as a kid always being a particularly dark mall. My mom had a particular preference for the mall and still does. The lifestyle wing used to be an open-air corridor with tall brick walls on the side and an elevated walkway in the center to the second floor that emptied straight into the parking lot. It had an Applebee’s in that wing and huge red banners with the mall’s signature “P” that is shaped much like a cloverleaf ramp. The Rich’s was also significantly expanded in 1987 with the Furniture/Men’s store. Also, a Morrison’s Cafeteria was located next to the Penney’s and the mall had staircases throughout that had fountains at the base up until 1993. Mom used to park at the Penney’s because she could always find a parking place there, so you can go figure why it closed. Nowadays, you do well to find ANY parking there. I didn’t know Macy’s brought Bloomingdale’s to Atlanta. I still haven’t been able to figure out what makes Bloomingdale’s different from Macy’s. It’s like Macy’s, but with a bowtie. I see a lot of similar brands; least the ones that I have an interest. Interesting that this mall once had both a Davison’s and Rich’s, considering that Federated owned both chains for decades. I guess they marketed both chains to different demographics, for all I know. My fascination with Atlanta-based former retail chains aside, I really love how the various renovations of this mall over the years turned out. The lighting is nicely done in this mall, the seating areas in the mall corridors(outside of the food court) are a nice touch, and of course I like how they kept a water fountain in the Nordstrom wing. 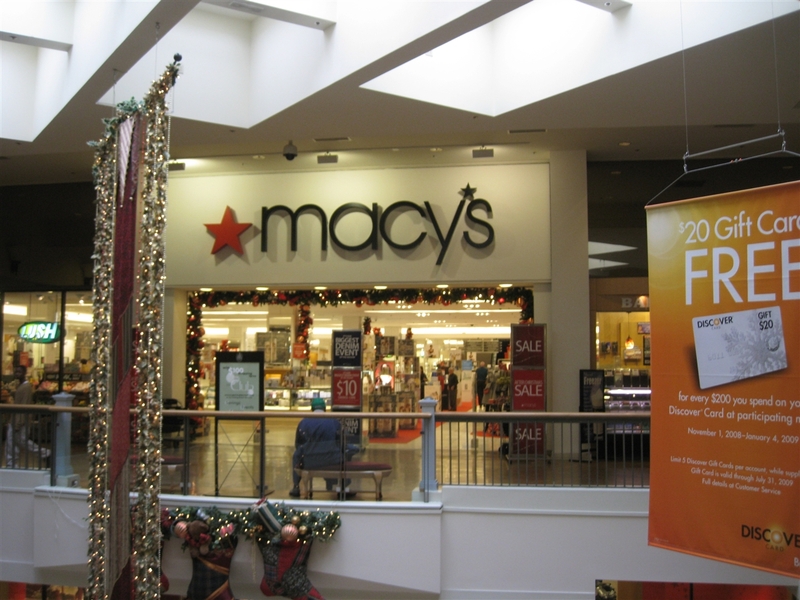 I’m really crossing my fingers that JT can find a pic of what that upper-level Macy’s entrance looked like when it had the Rich’s logo, pre-2003! I live across the street from this one and it’s a pretty hoppin’ part of town. I think Perimeter also had the last of the mall arcades, although that’s been gone for a while now too. I can’t imagine that the place would get dragged down by GGP. It’s always busy and I’d think that someone else would step in and run the place. If not, maybe I’ll move across the street from another mall. 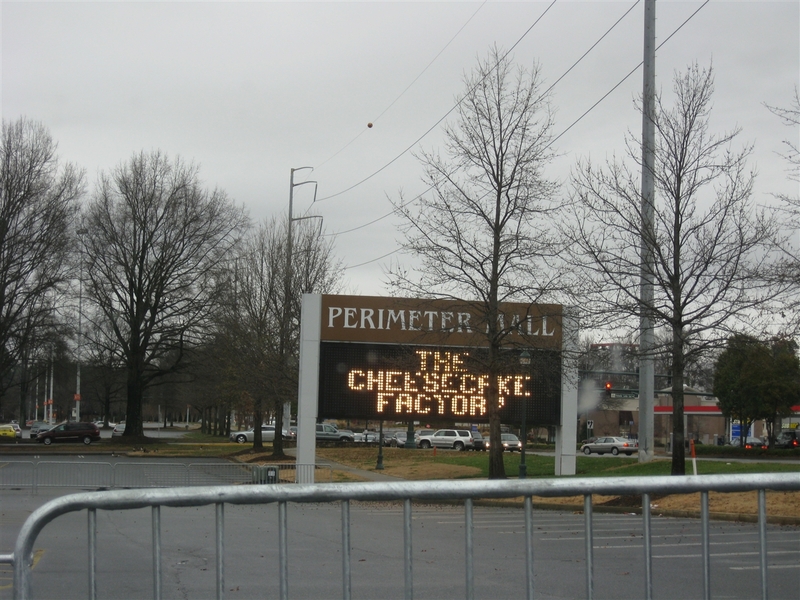 I also went to Perimeter growing up when we’d visit relatives in Atlanta…. it always had a presence of stability and wealth. Today, it is an example of taste. Filled with great things, yet a little smaller and cozier than the others. I’ll always love it and am very thankful that Bloomingdale’s and Nordstrom are there. I shop here relatively often despite the fact I live aways away in Marietta, GA since its close to the Children’s Hospital we’re always at with my son. 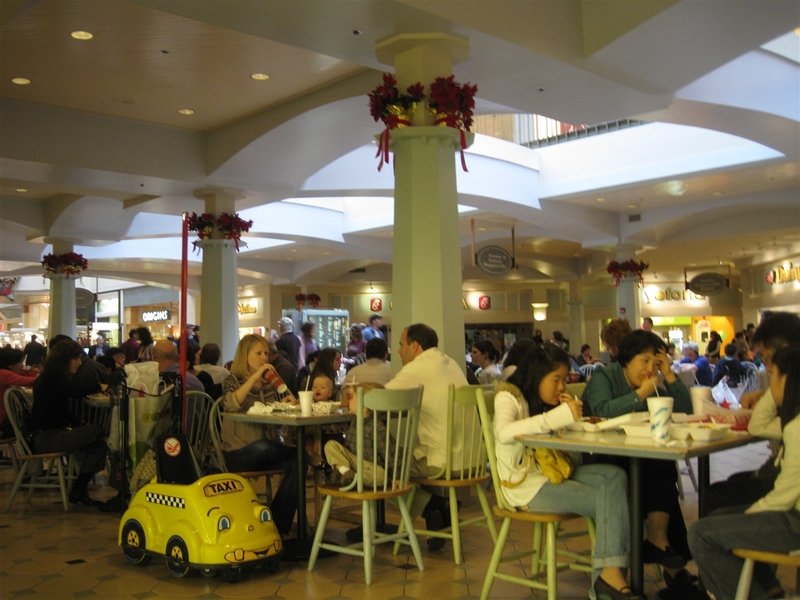 The food court has some great independent places with great food for a food court to go along with the typical entries. I’m still bummed the Crate and Barrel closed there last year as it was the easiest one for me to get to. They claimed it was under performing compared to the larger ones in Lenox and near North Point that have furniture showrooms. When they closed I made off with a good number of their fixtures and shelving for use in my home much to my wife’s chagrin. I’ve probably got the nicest basement workshop shelving using their white laquer laminate finish shelves and took some of their stainless steel finish shelves and fashioned them into a coffee table. I’ve got a couple of their gift wrap cabinets too that have come in handy as well. The price points at Bloomingdale’s are set way higher than at Macy’s, for one. I think this has become even more visible as Macy’s has diluted its brand by opening stores across the nation. I used to consider Macy’s in the upper-mid tier of department stores before 2003 when they decided to become a national brand with stores in nearly every state. Bloomingdale’s is definitely top-tier, and I’m not sure they carry the Charter Club or Alfani Macy’s store brands; in fact, I’d be they didn’t. They do, however, have $500 jeans and $200 t-shirts and nonsense like that for the super-wealthy. Bloomingdales’s store brand (at least in the Mens Dept) is Joseph & Lyman. In addition Bloomie’s is still one of the few department stores left that have their own restaurants within (Short Hills alone has La Provence and the B-Cafe)…even Nordstrom did away with The Pub and Garden Court restaurants a few years back, but they still have the Cafe and E-bar. Bloomingdales also carries certain names in jewelry and accessories that one may not see in Macy’s. Simon will try to pick this mall up if GGP goes under. It’s a nice fit with Phips plaza & Lenox Square. Atlanta has a dizzying amount of malls. Given its proximity to Phipps, Lenox, and even North Point (not to mention the other ones I can’t remember), I’m almost surprised there’s another upscale mall. IMO this one’s a little dull and dark but very quiet for its popularity. It’s interesting you mention Nordstrom did away with their full-service restaurants at Perimeter, mallguy. I thought Nordstrom was one of the few department stores left that still had restaurants in certain stores, but I guess they’ve increasingly moved to get rid of their restaurants(except for cafe-style stands), and didn’t even realize! I believe Prange Way is right about Bloomie’s and Macy’s definitely catering to different demographics, since I’ve noticed similar differences(to what other posters have said) between both the few times I have shopped at Bloomingdale’s in the past. I forgot to address Sean’s comment. I have to agree with him that I would NOT be surprised if Simon picked up quite a few malls from GGP, if they were to go under. I could also see other companies like CBL and Taubman(for the latter, more or less their upscale malls) looking to purchase malls owned by GGP, but we’ll see what happens when February comes. The Atlanta Bloomies are less different from Macy’s than is usually the case. National chains seem to “narrow cast” their selections in Atlanta compared with other cities. For a place where shopping is such an important recreational activity, it’s not a very interesting place to shop. Federated bought Macy’s in ’94; they bought Rich’s before that but provided much more local autonomy before the consolidations of the 90s. Bloomie’s, for example, ran very different stores from Macy’s in DC and other East Coast cities in the 90s. Mallguy, you are incorrect that Nordstrom is doing away with full-service restaurants in its stores. They recently opened a new restaurant concept at the Burlington Mall in March called “Blue Stove”. It is a tapas restaurant and they have opened it in a second Nordstrom location in California. Honestly, the only reason I go into the local Nordstrom location in Providence is to eat at the Nordstrom Cafe. Their merchandise is way too expensive for me, and I never find anything worth buying during their sales. This mall seems to be very successful despite being so close to two other luxury malls, Lenox Square and Phipps Plaza. It has some very interesting architectual details, such as the chandeliers, light fixtures, and the rare fountain. I wonder how successful this malls will remain given the current economic climate. With the number of bankrupt retailers we may see in the near future, there might not be enough retailers to fill the vacancies. But this may also be an opportunity for smaller retailers to emerge and gain popularity. That is just how the retail enviroments goes. People get bored with a brand, move on, and another brand swoops in, takes its place, overexpands, and shutters. History repeats itself over and over again. I stand corrected on Nordstrom…I’m speaking from my local PoV where all the area locations (Menlo Park, Garden State Plaza, Westchester, Roosevelt Field, Short Hills, King of Prussia…Freehold never had the sit-down restaurants) closed The Pub and The Garden Court, making them into store space. I also like Perimeter Mall and am impressed with its architecture. Is that fountain near Nordstrom (which is very cool looking btw) the only one in the mall? Store-wise, it seems to have a lot and is a great alternative to Phipps Plaza/Lenox Square to those who live in the Northwestern Corner of the Atlanta Metro area. Atlanta’s shopping mall lineup is quite interesting as one can debate that Atlanta is over-malled. While I haven’t been down this way in a very long time, I am aware that there has been growth in metro Atlanta and malls do hang on. Cumberland Mall (close to Perimeter if I’m not mistaken) came across hard times recently and has strongly rebounded. 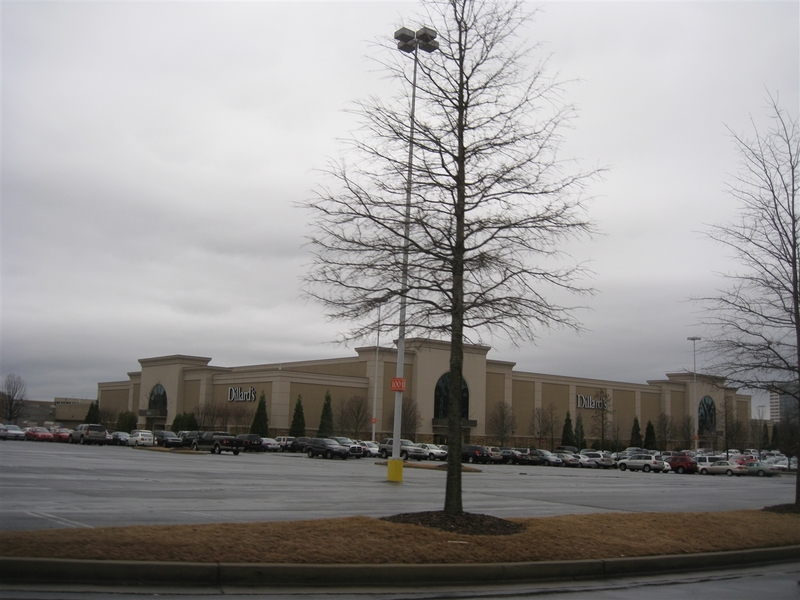 Also despite the successes of The Mall of Georgia, Gwinnett Place still hangs on and does OK…maybe not as well as it used to but they still have 4 anchors. 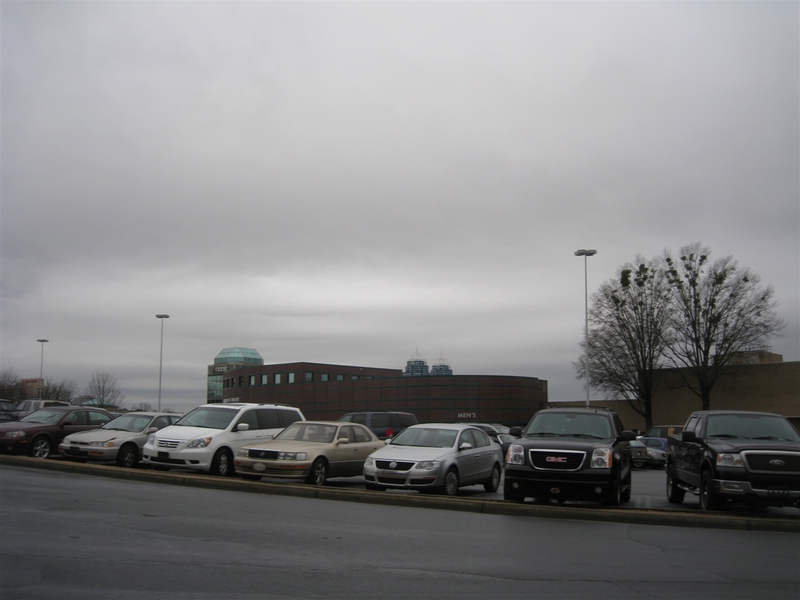 Atlanta is full of dead and dying malls. North DeKalb is being redone as a not quite lifestyle place. It probably would make more sense as non-retail. Greenbriar has been hurt by a nearby power center. The other southside malls are in trouble. Cumberland has not done that well since the remodel and despite the high volume Rich’s, South DeKalb hasn’t seemed that busy. The Atlanta arae continues to grow, but the new jobs don’t pay as wellas the old ones. The IT sector dried up earlier in this decade which hurt North Point. Delta has cut back, although the cuts were more evident outside of Atlanta, in the beginning and merger with Northwest might help, although putting together two airlines with terrible customer service isn’t a great business startegy (example—my last Delta flight involved multiple delays and when the plane arrived, it was the wrong aircraft). Coca-Cola went through cutbacks (unheard of for them) and the last big unionized industrial emplyers have been shuttered (Ford & GM), along with two military facilities. Building low wage jobs and losing, stable well-paying ones is not the best climate for new malls, but the developer-friendly (and developer-bought) suburban jurisdictions have meant taht development often outstrips reality. The housing market was hit early and hard in Atlanta, esp. in outlying areas. To be fair, Rich, most of the dead and dying malls you mention are in poorer parts of the city. Yeah, the malls in Dekalb are in trouble. There are more rough neighborhoods than nice neighborhoods there now. The same could be said for Cumberland. Lenox, Phipps Plaza, Perimeter, Mall of Georgia, Discover Mills, North Point, and those newish outdoor malls in Norcross and Forsyth are all doing well and they’re all within about 30 or so miles of each other. North Point does have a vacant anchor but it’s set up for 6 and I just don’t think there are 6 these days. The missing anchor doesn’t seem to affect the foot traffic. A lot of manufacturing is dying in Atlanta and Delta is also struggling mightily but that IT sector you mention in Alpharetta is alive and well. My cousin and brother just ditched their current IT jobs for higher paying ones there. I get frequent calls asking if I’m interested in IT jobs in Alpharetta (mostly from recruiters who don’t know it’s 50 miles in heavy traffic from where I live). The only people getting really hurt by the IT sector in Alpharetta are those without experience of some kind. It is a bad time to be entry level there or anywhere. Back to the main point, I used to shop primarily at North Point and Perimeter back when I lived in the area. I always liked North Point better. It was a little closer to me though. I think if the distances were reversed, I’d probably have preferred Perimeter, especially after the North Point Babbages turned into a Hello Kitty store. Perimeter is a very nice mall. It is kind of obvious that it’s been added onto more than once, but that doesn’t detract from the mall in any way. The mall hasn’t been Simonized so there are still a few unique shops there last I checked but not as many as there used to be. The mall area is atrocious though. It’s really hard to make your way north and there seems to be no rhyme or reason to the street layout or the placement of mall-area shopping centers. Bloomingdale’s starts, price and quality wise, where Macy’s leaves off. There’s more current fashion, there are far more restaurants and food concessions, the furniture and housewares are more contemporary and the stores themselves have an unmistakable look. The older stores have a very 1970s look and feel, while the newest stores and the 59th and Lex flagship feel very upmarket and modern. There were buildings in Alpharetta without tenants for quite a long time during this decade and IT people who were delivering phone books.With the loss of GM and Ford and the decline of Delta, bell South and others, Atlanta’s smalll blue collar base probably has suffered as much or more than most industrial cities. Not all of the troubled retail in Atlanta is in poor areas. Greenbriar serves a well-off area and gentrifying suburbs. Cumberland draws low income shoppers but is close to wealthy areas and in the middle of solidly middle class suburbs. North DeKalb is near Druid Hills and highly gentrified areas, but seems unable to capitalize on this. Toco Hills, a redone 50s strip, which serves much the same area is in much better shape. Northlake serves a solidly middle class area and except for some of the anchors and the food court, it’s in trouble. The big box nearby does better. Luxury Phipps has had vacancy problems and has wound up with a bizarre collection of tenants–Tiffany’s and a big cheesy dental clinic. Atlanta is just a good example of too much homogenized retail, and after years of attracting wealth, it’s losing it even as it adds people. Hey, Jonah, if you want to know why SKILLZ is located at Perimiter Mall, I read somewhere that it is an inner city fashion specialty store. 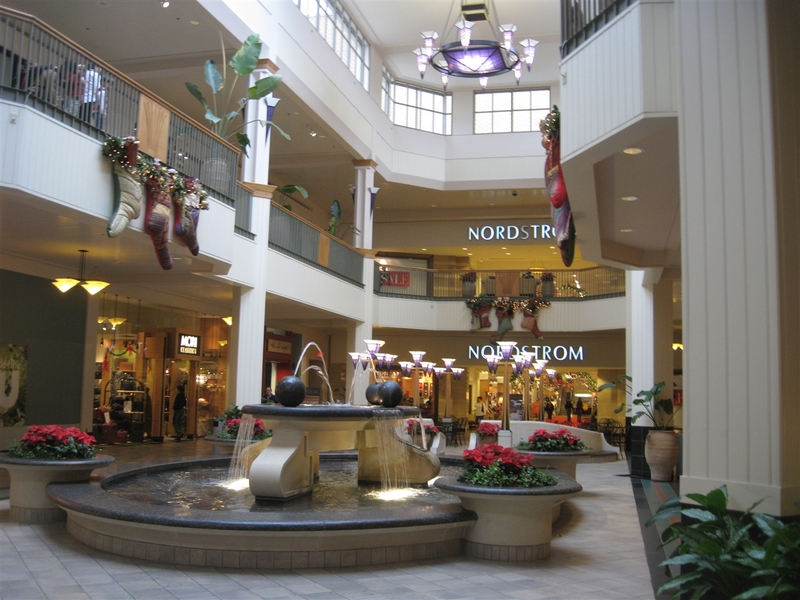 Up until the conversion of the original Macy’s to Bloomingdale’s in 2003, there was a large, submerged “pond” water feature on level one just outside the Macy’s, where the corridor leading to Nordstrom began. As I recall, this “pond” was designed to look like a natural water feature, with real rocks and boulders around the periphery, and a “stream” trickling into it, and lush greenery. This feature (no doubt a pain for mall management – I recall signs asking patrons to please NOT throw coins in) was eliminated and the floor paved over just before the conversion to Bloomie’s. I’d guess Bloomie’s made sure this happened – to help faciliate shopper access to the converted store’s first level and cosmetics department. This area now offers table seating – a quieter alternative to the noisy food court. Atlanta has 3 stores that show up in malls from out of nowhere. Skillz, Know Style, and Trio. 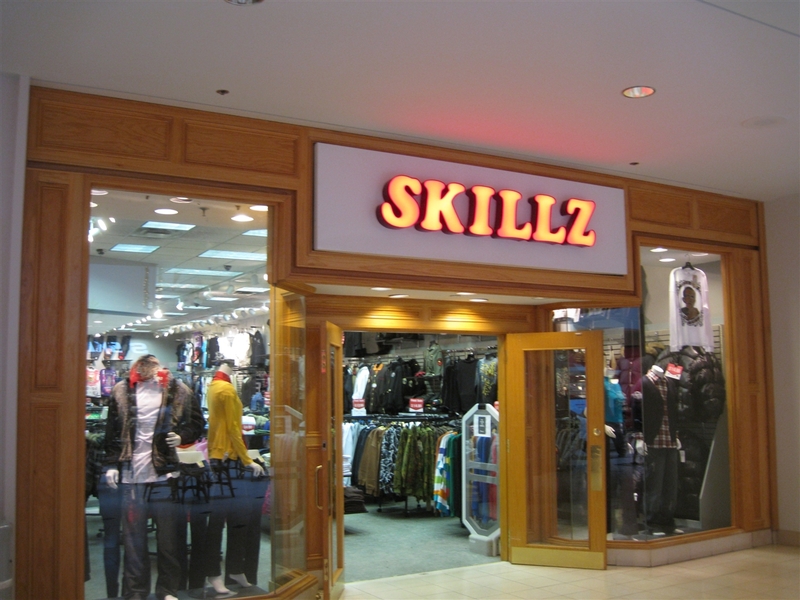 Skillz is super tacky, with god-awful hip-hop clothing that is SO out of place in Perimeter Mall. I just noticed that they’ve popped into Mall of Georgia too. Horrible. Trio shows up in every metro mall. They’ve shown up in Lenox, Phipps, Perimeter, North Point, Town Center at Cobb, etc. They sell handbags. Don’t ever try to call one of their stores – the number is always disconnected. I think they come in and take over the leases of stores that have recently closed and serve the remainder of the term. They jump around all the time, even within the same mall. Strange. No website either. Know Style is a womens clothing store. I have no idea who owns them, but they also pop up in every metro mall. They popped up in Lenox one time on the main corridor and everyone in the Atlanta retail community caused a stink about it. How could Simon lease such a high-profile (former Ralph Lauren) store to a cheesy local retailer? They soon closed. Skillz is the worst though. The fact that they are in Perimeter is frustrating. Perimeter mall has all ways rocked being a great place to get good prices on name brands and see new styles at the latest stores. It has held it’s own over and over again, with every remodel it has only gotten better. When they added the storefront feature with the valet parking, and Harolds, Goldfish, Garrisons, and Cheescake Factory it was a huge hit. I heard that Garrisons has closed and I think there was a Magino’s which I have not heard of in a while. The mall looked great when i was there about four months ago, it brings back a lot of memories and I still have friends that have part time jobs in some of the big retail stores. Thanks to Dunwoody and the corporate buildings, the mall looks to have a great future when the economy starts to pick up soon. Unfortunately, the date of the first renovation is wrong. The mall was renovated around 1990 and the shooting took place in the mall in 1988, as I was there. This is my favorite mall in Atlanta, but the traffic is pretty bad. I miss Rich’s and Penney’s being in the mall. @mallguy, From what you could tell, is there a way to connect Phipps Plaza with Lenox Square? I mean they are so close to begin with, that it would seme logical to do so. If it could be done, it may correct a few deficiencies that Phipps Plaza has including store turnover. @SEAN, You’d have to cross a sizable piece of parking lot at Lenox and a complex, busy intersection, plus, they are at different elevations. On top of all that, ATL is a non-walking place. People would still want to drive. There used to be shuttle bus service (both are Simon malls) but it was poorly used. @Rich, Oh I see, wasn’t aware of the change in elevation or of the malls setback. acording to http://www.walkscore.com Atlanta has a citywide walkscore of 53 making it somewhat walkable, but I’m not sure how much a resident can walk. If you want to compare, Charlotte’s citywide score is 39 & Miami/ Miami Beach is 75/ 77 respectively. Check the site for more details on how the score is derived. @SEAN, Atlanta is not the best walking city, outside of Downtown and Midtown. The malls are diagonally across from each other and a pedestrian bridge would be a challenge. There are sidewalks and it can be done, though. Thankfully, I had someone driving. And strangely enough, both malls advertise in “getting here” the use of two different MARTA stations: Lenox Square using the Lenox Station that is right there and Phipps Plaza using the Buckhead Station, a few blocks away. Lenox Square kind of reminds me of a Garden State Plaza, and Phipps a Shops at Riverside. @mallguy, Thanks for the description. I recalling speaking to someone at MARTA a long time ago & they told me that the #25 Peach Tree line serves both Lenox Square & Phipps Plaza. I’ll bet it takes more time to travel through the parking lots then traveling on Peach Tree Road itself. @SEAN, The walk doesn’t look as bad as one thinks. Most of the parking lots at Lenox are decks, the walk to Peachtree Road is rather short, and at Phipps, Saks is the closest entrance if one were to do the walk. I really like MARTA as a transit system. Trains are modern, stations are fairly clean and well-lit. I would compare it to the Washington Metro or BART. It does the job of getting from Hartsfield Airport to Downtown, Midtown and Buckhead, but for a city the size of Atlanta, it could have a little more reach. @mallguy, OK, I get it now. As for MARTA not having greater coverage can be explaned by politics, real estate interests & socio ecconomic factors. The first two go hand & hand while the latter falls under both demographics & class. Developers grease the hands of local polititions to keep adding newer malls while others struggle & yet some of those struggling centers aren’t nessessarily that old to begin with. This adds to the sprawl problem. In metro Atlanta, there’s a stark sosio-ecconomic contrast wich is reflected in local politics. Once You enter the suburban counties, it is very conservitive for the most part & most residents don’t want there tax dollars spent on public transit despite the traffic & sprawl. @SEAN, Friends down there tell me they had to move mountains to get the Dunwoody MARTA station built. The town didn’t want it. In the end, it serves the mall well, as Lenox does Lenox Square and Phipps Plaza. Too bad I couldn’t get up to Perimeter Mall…looks like a great mall, would’ve liked to see it. @SEAN, The suburban counties vary greatly in their demography and politics. The Northern and Southern part of Fulton County (which includes most of Atlanta) tends to reflect nearby areas of Atlanta proper and range from white, wealthy and conservative to working class and more African-American. The city of Atlanta is partially in DeKalb County which has a wide range of incomes and ethnicities, and supported construction of MARTA. the counties to the South have rapidly become largely African-American and have always been largely blue collar. Those immediately to the West are becoming more diverse and Gwinnett, the white flight haven of the 80s is now the most diverse County in the South, though solidly middle class. the funding for mass transit reflects the composition of the area 40 years ago which is different from what it is now, although DeKalb–then largely white and controlled by a long lasting machine did vote to be part of MARTA. @SEAN, Residents of ATL don’t walk. Moreover, even some of the most walkable neighborhoods don’t have walkable access to super markets, etc. the usual priorities of intown gentrifying neighborhoods are restaurants, not bank branches, super markets, etc. It’s a cultural thing. @Rich, A lot of that relates to single use zoning regulations. @SEAN, Not really. as in most of the country, the most walkable areas are neighborhoods that initially developed in the streetcar era or the early post-WWII era. I lived in a couple of those areas. they once had useful neighborhood businesses. Now they have restaurants and the occasional boutique. If they are relatively poor, they have liquor stores and occasionally a failed urban renewal plaza. In DC, for example, similar areas have functioning groceries, hardware stores and the like. @Rich, True, but cities like Atlanta & it’s suburbs were designed around the use of cars & the zoning regulations or lack there of is a contributeing factor in the current patchwork of subdivisions, wide streets & lack of adiquit padestrian facilities. Now if you compare this to DC & it’s burbs you will find some similar problems like Rockville Pike or Jefferson Davis Highway,but not to the extreme found in Atlanta despite DC’s own traffic issues plus public transit. Annual roundtable offers market analysis and expectations. In September, more than a dozen retail professionals from the Atlanta area and Southeast region gathered at France Media’s offices in Atlanta to confer on the state of the market. Attendees included: Ray Uttenhove, EVP and market leader of SRS Real Estate Partners; Peter Pelt, regional development director of Weingarten Realty; Mike Puline, southeast leasing, DLC Management; Mac McCall, regional managing partner of Franklin Street Real Estate Services; Whitney Knoll, principal of Newmark Knight Frank; Monetha Cobb, senior director for Franklin Street Real Estate Services; Abe Schear, partner of Arnall Golden Gregory; Jim Hamilton, director of Holliday Fenoglio Fowler; Sam Kupersmith, managing director of Cantor Commercial Real Estate; Ruth Coan, partner of The Shopping Center Group; Rod Mullice, managing director of Newmark Knight Frank; Ralph Conti, founder and principal of RA Co Real Estate Advisors; Bob Francisco, leasing director of Muntzing Sattele Co.; and Ted Benning, president of Benning Construction Co.
SCB: How do you see Atlanta compared to other markets around the Southeast and around the country? Uttenhove: One of the challenges right now is there are so many mixed messages coming out of this economy. It’s hard to get your arms around what’s truly going on. Despite the fact that [Atlanta’s] unemployment is very high in comparison to the national average, the commercial real estate market is holding up fairly well here, and we’ve seen some definite improvement. Comparing it to where some of our other offices are, Dallas in particular has suffered a little less, just from the standpoint of vacancies and some of the issues. Perhaps their economy was a little more balanced. We’ve seen that some in the West as well. I would say our Florida offices are probably running about where we are; it was hit pretty hard early, but they’re picking up. Peter Pelt (foreground) responds to a question. From left to right, Whitney Knoll, Sam Kupersmith, Ralph Conti and Mike Puline. Pelt: We’ve seen improvement in Florida. In Atlanta, we’re seeing fewer rent reduction requests, and we’re seeing some rent growth in the good properties. We have probably 15 assets here, and I think just one has a problem with dark space. It’s really a quality asset situation more than anything else. We seem to be doing a lot more joint ventures, so I see a lot of broken projects in other cities. Some of the middle markets, like Knoxville, Nashville and the Carolinas, have probably weathered the storm better than we have, simply because they didn’t have the economy that we have. That being said, it’s going to be a slow climb back. Bob and I were just comparing today to 4 or 5 years ago — it’s been a dramatic change for most of us. It’s just going to take a while and that all depends on job growth and housing. Puline: Our sites in the Northeast seem to be holding up a little bit better than our stuff in Atlanta. Our regional centers here seem to be performing better than our neighborhood centers; our in-line neighborhood shopping center leasing remains pretty difficult right now. We’re having to be very aggressive and spend a lot of time out in the market canvassing. Right now, in the neighborhood centers, it’s just a matter of trading tenants. You’re moving across the street, you’re moving a guy from down the road. We’re seeing very little in the way of new tenants coming into the market in the neighborhood asset class. McCall: Definitely on the buying side, investors still look at the long-term side in Atlanta, especially for core grocery-anchored centers. Dallas [Texas], does much better due to its economy and the sort of industries they have versus our economy based on construction, banking and real estate largely. The Northeast and other core markets are much more stable than Atlanta. Atlanta is very similar to Florida and other markets like Las Vegas and Phoenix where it’s just a big, robust housing expansion. That’s really suffering right now as it slowly absorbs. SCB: What about the investment sales aspect of the business? Where do you see the activity in the Southeast? Is it mainly in the Atlanta area? Knoll: With [Atlanta’s] housing market, it’s the first time we have not led every other city coming out of a downturn. Cities in the Carolinas are coming out quicker. For the investment market, everyone is still very active on the core side and active in the REO side. It’s the barbell effect; the properties in the middle are having a problem. With a little bit of a disturbance in the CMBS market, that hurts a little bit more. People are a little afraid at this time. We need a little more stabilization in the financing market to be robust across the board in investments. But the core properties all over the Southeast — you can pick any state — are still high in demand. Everybody steps up for REOs as well. SCB: Mac, are you seeing a lot of demand there? McCall: We’re doing a lot of the REO, smaller strip center properties. There are huge amounts of auction properties being brought to market by the special servicers. Their pipeline is getting extremely full. It’s mostly outer-core, outline stuff; all strip centers where the loans are based on rent in the 20s while rent is probably half that in most cases. It’s going to be a long time before that non-anchored strip center product outside the Perimeter recovers, because that’s what gets foreclosed on. They’re going to be able to steal tenants from surrounding strip centers and create kind of a mom-and-pop tenant ping pong game, where people have good property, but a center that is not quite as well positioned down the street is able to attract tenants from their property. There’s a ton of capital chasing the REO side. Monetha Cobb and Mac McCall. Cobb: That, candidly, helps tenants when these assets are being adjusted so that the rents are more feasible. Assets trading hands or being adjusted down to the pricing that these tenants can pay leads to more activity on the leasing side. Schear: There are international investors coming to the United States. They’ve got plenty of capital and they are interested in assets. Certain companies are moving into the Southeast as well. I think that probably is a good thing in terms of property values. They are opportunistic and core buyers. Investors from all over the world are worried about political uncertainty and the markets. Hamilton: We just priced a couple of core deals in Atlanta, and I would say it’s equally as competitive to similar pricing metrics that we’ve seen in other markets, like the D.C. area, the West Coast or even South Florida. There are certainly still pockets in Atlanta where you do have the barbell effect. There is a little bit of uncertainty, but there’s huge flight towards core right now, and it’s more competitive now than it was at the height of the market and has more aggressive pricing metrics as well. SCB: Who do you see buying these centers? Hamilton: On the core side, there’s more money to put out now than there was at the height of the market. We’re seeing a lot of the same pension fund advisors and institutions in the marketplace today. In addition to that, we’re seeing new players and joint ventures that have been formed, who have been aggressive with some new acquisitions in the Southeast and Georgia. I think it’s really more of a supply and demand function than anything else. There’s not a lot of core product on the market, so everyone is chasing the same thing. It’s going to be interesting to see what happens over the next 12 to 18 months: what the capital is going to do, what type of product are they going to chase, and are they going to go out and start to look at the top 25 or 30 markets? A lot of public REITs have been focusing on the top 20 markets. Now, they may be expanding their net a little bit to look at the top 30 or 40 markets. There’s a huge opportunity right now with some of the best in class assets in secondary markets because there is a gap in pricing between a core asset in a primary market and a top tier secondary asset. The gap in cap rates is wider than it’s been in a long time. McCall: Private investors get squeezed out of investment sales by the REITs. Their access to capital is much cheaper than for the private investor. [Private owners] are hunting for deals, they just can’t find them. They are looking in secondary markets with secondary tenants, looking at Winn Dixie versus Publix, for example, just to get some deals and get their hands on them. Knoll: We’re also seeing Canadian investors — for the first time their dollar is worth a dollar in the United States — entering the Southeast. Canadians are more likely to look at a “B” property then some of our REITs or pension funds. Several partnerships have been put together. The biggest opportunity is that people are going to move toward that better pricing. There’s opportunity in the B product. I’m not sure when people will get there, but 85 percent of the market is B or C product. At some point, people will figure that out, maybe entrepreneurs with the other types of money, whether it’s a REIT or pension funds just like it happened 6 or 7 years ago. The institutional players aren’t going to buy it straight up, but they’ll let someone else do it and make a little bit better deal. I think that will continue to be pretty strong assuming our interest rates don’t go crazy. SCB: So what do you see on the market or coming to the market? You said 85 percent is B and C? Knoll: I meant 85 percent of the entire inventory has always been considered B and C, and the Bs and Cs haven’t sold as well. One of the problems is they are much harder to finance. The CMBS market has gotten a little shaky recently, and people just can’t quite get there, but they will. It’s a normal progression that when private entrepreneurs get pushed out of a certain area, they figure out ways to get in. I know several people forming REITs right now to buy the B product because they’ve eaten at the A’s and they are willing to take on a little bit more risk — as they should as entrepreneurs. SCB: Peter [Pelt], how does your company see the market in terms of opportunity here for expansion, or even with the retailers and their strength here? Pelt: In Atlanta, it’s been tough. I think the major tenant pipelines are — probably Ray and Ruth would say — thinned out, which is a good thing I guess. It seems like everybody is looking for the same site. Denser sites, with more emphasis on demographics, population densities, the same thing we all knew and loved 4 or 5 years ago. Suburban areas are pretty much out of the question, and will continue to be, so everybody’s looking for that magical redevelopment. We’re even getting into some shadow space and some freestanding development to get outside the box and continue the development pipeline. The opportunities are going to be unique. There are some smaller markets where you’ve got entry from new tenants. Publix is going into Knoxville, for example. But we don’t see a lot of it. Academy Sports & Outdoors is active, L.A. Fitness is active, so from a tenant activity level, it’s encouraging. SCB: On the CMBS side, can you give us a little overview of the market lately and how you view the Southeast in terms of viability for that product? Kupersmith: In general, the CMBS market really kind of came back a year ago, so we opened our [Atlanta] office in September of last year and had a really great start. The market was probably better this time last year in terms of the opportunity to finance properties because there were a handful of deals that made a lot of sense. They had a good location and good sponsorship. Now we’re getting to the point where we’re seeing the assets that we underwrote in 2007 that we don’t want to underwrite now. Now, we’ve got to look at rents to market, tenants to market, looking at rent roll and where the tenant is going to go. It’s pushed back the dollars, so the easy money is not there at 80 percent or 85 percent loan-to-value. It’s more around 70 to 75 percent and, to Whitney’s point, people are a willing to take a little more risk, but now they aren’t getting as much debt. We’re a little more conservative, and the buyers are a little more conservative, so I’ve seen things slow down to some extent. In general, the market got real hot for CMBS earlier this year. We saw pricing come down substantially and there were a couple of deals that went to market that executed well and pricing just came in, which heated things up a bit for everybody. We were hoping to be 200 basis points over the 10-year [Treasury rate] so you’re looking at 5.25 percent. On the last few deals, the price is a lot wider. The market is pushing back so we’re seeing coupons widen and, as a result, the deals that had been bought on a 7 cap won’t work. That kind of slowed things down for us a little bit. SCB: Who are the types of borrowers that can do CMBS? Are they familiar with CMBS or are they new to the market? Kupersmith: It’s been a little bit of everybody. We’re working with REITs; we’re working with one-off, one-man shops doing small deals. By now, if they haven’t done [a CMBS financing], they are familiar enough and they understand what they are getting. It’s not the same smooth process it was in 2007. It’s a little more complicated, but I think we serve a purpose. If you can’t get a life company to finance your retail center, unless you want to do a bank loan and have full recourse, you come to us. SCB: Abe [Schear], as one who is in the know on a lot of local deals, what do you see going on in the market? Schear: I agree with what most everyone has said. There are some interesting projects that are going on. The property that everybody calls “Bobby Cox’s Baseball Property” [LakePoint Sporting Community] in Bartow County is a huge project that ultimately will be built out — hopefully in the next 5 to 6 years. It’s an interesting, large, mixed-use property that probably has more architecture done successfully than not. I think the Jamestown property over at City Hall East [Ponce City Market] will get done. Jamestown certainly has the ability to do that property; they didn’t buy it to not do it. The project that’s now called Buckhead Atlanta probably will get done. Oliver–McMillan intends to get started next year and they probably will. That’s a pretty sophisticated development company and I think it’s likely that’ll get done. Those are three interesting projects for the Atlanta market. Two are redevelopments and one is an out of the box development project. At the end of the day, we are coming out of the end of the pipeline. We’re still in the same fundamental business, but we’re trying to figure out different ways to do what we did 3 or 4 years ago. The one thing you can do in Atlanta is to predict is that in 15 or 20 years we’ll have another million or more people. If we have another million people in Atlanta, it’s going to drive some development somewhere. That’s different than other markets. SCB: Ruth [Coan], where are tenants looking when they come to Atlanta? Ruth Coan and Abe Schear. Coan: The good news is, and I would concur with Ray’s observation, that the fear and the negativity that are out there feed into concerns of retailers. Yet, they are actively looking at this market and probably most of the retail brokers here are busy. There are several categories that are active. To Abe’s point, there are different tiers of activity. There’s the redevelopment projects, which are exciting and have more of a signature feel to them, like the Buckhead Atlanta project, City Hall East [Ponce City Market], Prospect Park and Atlantic Station. There’s a little bit of panache that we’re hopefully creating with these projects and they’re looking for something a bit different, a little more upscale. Based on what we’re hearing coming out of Prospect Park, it’s going to be a good project. There’s a lot of pent up demand and the retailers are all visiting that project. We’ve got that excitement. On a different end, the discounters like Walmart are active. There are projects all across the city that Walmart is feeding. They are flexible and the size that they’re considering really fits a lot of redevelopment projects. They are filling some holes, taking some of the second generation space, tearing it down in some cases, but there’s opportunity and excitement in what they are creating. Mullice: The LakePoint project is great because it’s moving toward experienced retail. I think if you are going to do retail outside of the city core, you have to focus on more than just the big box. The whole concept of adding sports and layering it on hospitality and retail, that’s going to be something you’ll see more in the future. Projects also have to have a strong private/public partnership. City Hall East had the city [of Atlanta] technically as part of the capital stack. They had historical preservation tax credits in the deal also to make the development move. The area where I see a public/private partnership participating for successful projects is at the airport. We’re going to have 217 new shops to meet very strong demand. You have 20 million deplanements a year at the airport, so anything around the airport you’re going to see some demand in the future, especially on the Georgia International Convention Center where they have the new Marriott hotel. Also, MARTA is looking at doing retail at its stations. They’ve done a study recently and those are going to be a strong demand at the terminus buildings where you have people driving in and getting on the trains. Schear: To that point, the Beltline has had a pretty good year in Atlanta. There certainly will be some new development, near the Beltline where there are access points. You are going to be able to track development near success points once it moves to the stage of being able to use it. You are going to see some development nearby, certainly in neighborhoods. Ralph Conti (speaking), Mike Puline (right) and Ted Benning (left). Conti: I happen to be working on Prospect Park and there’s a lot of activity on that project from a tenant interest standpoint. That is a suburban, upscale, mixed-use project. I am also working on a power center project on the south side of Atlanta [South Point], which also has a lot of retail activity. As a developer, you need to become an innovator now. You can’t just sort of do the same old-same old, with the exception of pure fundamental retail development, grocery-anchored shopping centers that have little opportunity to get too innovative. In mixed-use projects, you need to be an innovator. You need to create a different mousetrap, because that’s what the consumer is asking for. Retailers are adapting to that consumer demand. Where you can create that experiential component, you’re going to see those projects do very well. SCB: What’s driving the demand for South Point and Prospect Park? Conti: Core fundamentals. At Prospect Park, the Alpharetta market just has tremendous demographics and it really doesn’t have a project of this ilk, so it’s going to be a one-of-a-kind. Those opportunities are few and far between. On the South side, at South Point it is pent-up demand. That project has been floating around for 5 years; it’s taken a lot of time to develop that project. Retailers have finally figured out that there is demand on the South side of Atlanta. There are people who live there and if you do zip code counts, they are all shopping in Buckhead. The retailers who are open at South Point are all doing extremely well. I think Ray and Ruth would probably agree with me that it’s going to become the premiere shopping environment between Atlanta and Macon — it just happens to be right dead in the middle. SCB: Ray [Uttenhove], where are you seeing retailers ask you to go in the market? Uttenhove: One of the areas of focus is in town. We’re seeing some hybrid kinds of tenant mix. It’s no longer strictly lifestyle tenants dictating; they are mixing it up. Recently, HomeGoods opened in The Forum on Peachtree Parkway and is bringing another dimension to that project. Retailers are, for the most part, clearly looking for opportunity. Retailers are honing their specific game — Walmart is a good example. But even in the smaller markets and middle markets of Georgia, there is demand. T.J. Maxx opened in Dublin, for example. It’s a very small market but they understand how to operate in a small market. They followed it with Milledgeville. Those are definitely small markets, so retailers are filling their pipelines with existing product in a much more creative way than they did before. Coan: A lot of the retailers are looking at opportunities in some of the smaller markets because they can look at a larger trade area — and it’s a verifiable trade area. JoAnn’s, which historically was more in the metro areas, has been very successful in expanding to areas like Brunswick, Dalton and Gainesville [Georgia]. These are markets where they are absolutely a new entrant. Other retailers are similar; they are exploring these opportunities and finding that there is pent up demand for some of their services. They are resizing themselves in order to accommodate these markets. Where they might have been 40,000 square feet, they are now 25,000 square feet, but they are creatively finding ways to expand into the market and present a full array of their product in a smaller size. SCB: Those of you on the ownership side, are you seeing tenants look at locations they wouldn’t have looked at 5 years ago? Puline: You’re definitely seeing that. It’s just a matter of shopping centers not being built and retailers needing to grow. They are having to look at existing centers, whereas maybe they wouldn’t have gone into a particular type of center a few years ago. Pelt: Not so much maybe different types of locations, but, like Ray alluded to, downsizing has been a big deal due to the impact of the Internet. Most tenants, maybe with the exception of grocery stores, have really adapted their sizes to different markets and that’s giving them additional opportunities. They’re not discounting demographics and the things they normally look at. SCB: Whitney [Knoll], is there any fear from the investment side that the value of a center is impacted with lesser tenants in better quality centers? Knoll: The biggest underwriting is in the tenant — is he going to pay if he’s not a credit tenant? However, you’re getting credit tenants back into areas that haven’t had them. Having credit like TJX makes a big difference now. People have a long enough memory to realize that the non-credit tenants are the ones that weren’t able to keep up when you take away small business loans or bank loans. TJX or Walmart don’t need those. That’s key and people are continuing to be suspect of non-credit tenants. We’ve been lucky; all this pain actually re-priced all the real estate, especially in Florida. Here, everything has been written down by 40 to 50 percent on small shop space. That is good for investors. Maybe we’ll get back to reality, it’s just so painful to get there. Ray Uttenhove, Rod Mullice and Jim Hamilton. Uttenhove: Retailers have adjusted to this market. One of the adjustments they have made is that their sales forecasts are different from what they were pre-recession. This impacts a lot of the deals that are getting made; it definitely had an impact on rental rates and occupancy costs as retailersr are being much more conservative. They can’t get approval in their committees without having a fairly conservative approach. All of their models have been adjusted to that. That makes it a little trickier, a little harder to do construction. It means that a lot of the time developers have to look hard at what it means for my exit strategy, do the properties have good credit and can I make those adjustments accordingly. So it’s part of the pain we’ve gone through and one of those adjustments. Knoll: I was asked by one of the developers that I work with who was building on an outparcel: should I wait for a restaurant or should I lease to an oral surgeon? I know he’s going to sign a 10-year lease and he makes a lot of money. They sign 10-year leases, they have great credit and baby boomers are getting old. Schear: And they don’t spend as much time negotiating a lease, whether it’s with me or with somebody else. They are interested in the basics and often you’ll be able to get them to sign a very good guarantee on top of financials that are already somewhat usable. So it’s a win-win all the way for the retail developer/owner. Coan: Co-tenancy becomes an issue, particularly with power centers who lease to some of these medical services. In so many instances, they are going into smaller centers where co-tenancy really isn’t an issue. In Dunwoody, there was just a physician who opened in 10,000 square feet. He’s in a secondary center, but he brought the entire credit of that property up; he certainly brought the occupancy substantially up and the rest of the retailers are really more than happy to feed off of the constant flow of patient population that’s coming in. You’re going to see a lot of dental care; there are several chains that are coming in and looking at end caps in some of the smaller, more promotional centers. The disconnect that we’re going to get with some of those is going to be for the smaller centers where these medical services are a very effective way of backfilling. They also take a heck of a lot of parking. Francisco: When you backfill with medical tenants you can complement by using a pool of tenants like restaurants and vitamin stores; you remarket your centers accordingly. It’s no different than any other anchor. You have to say, ‘Now that I’ve got this user, what do I need to do?’ You can’t really go with what you typically do on a core asset. I helped one owner place a library at a center in a space that had been dead forever; it was an elbow in a strip center. The library comes in and brings the moms and kids. You can take that core group and complement what you have. Kupersmith: The kind of feedback I get from the investment community whether you sell a loan or make a loan, is why is that hospital there? Conti: That goes back to the core fundamentals of the business: if you’re going to do retail, make sure you’re on a retail segment. If you can do mixed-use, get on a mixed-use base. I don’t think people are going to stare outside the fence lines much anymore. Puline: I have yet to see a shopping center that’s 100 percent retail. I don’t think they exist in today’s market. You’re always going to have services that are constantly changing. In this economy, more so than in the past, you just have to adapt to what’s going on in the marketplace. Hamilton: From an investment standpoint, we’ve seen a lot more service uses coming into the properties. The reaction from the investment community has actually been positive, whether it’s been a doctor’s office, an upscale spa, or a computer repair shop. We’ve seen landlords and investors adapt as well. We’ve got two core properties in Atlanta right now that just priced and both had service providers who have recently done deals. These are our core buyers that sign off on these tenants and think they are a positive attribute to the property. McCall: Those tenants, the medical, the colleges, those people that are taking the backfill space, realize that visibility is important, much like retailers. That’s a great way for dentists and doctors to be out of the traditional office park. Uttenhove: I think that the important thing is — and I’m just sitting here thinking about retailers’ reaction to having a doctor’s office next to them — is that it is important that owners and developers understand what their center needs and that they understand their target customer and that they are not exploiting. There is still shopping that is critical to your apparel tenants. They love having medical in the area, they just won’t want it next to them. Part of our challenge has been created because of broken retail and we’re trying to figure out how to plug the holes. Francisco: The worst part of this particular cycle is that there is no bank lending for franchising. It’s unbelievable. That’s where the growth always has been on little shop space and we don’t have it. Until that changes, you’re not going to have straight retail because there’s not any small mom and pops. Schear: For those of us that have been in the business for two or three cycles, as the economy comes and goes and the cycles come and go, [banks] ultimately begin to see business is fine. This cycle is different. When I look back at the cycles that were in the late 1980s and early ‘90s, there weren’t any Costcos, Targets or Sam’s and there wasn’t the Internet, for that matter. It’s difficult to fill up these spaces today with small tenants because the big box tenants murder. That’s not good or bad, it just is what’s happened and the Internet may hurt or help the big box tenants. We didn’t have Amazon or the like — those are invisible tenants. I think Ray’s point is absolutely right. You’ve got to sensibly merchandise any property, but properties are owned by people who want things leased right this minute a whole lot more than they want to hold out for the right tenant for a year or two. At least that’s my experience. SCB: Ted [Benning], what are you seeing? What do you see in the market as a contractor? Ted Benning and Ralph Conti. Benning: We went through the first phase, which was that the retailers were shocked. All of the performers stopped working inside the suburban centers and they needed to have a certain amount of square feet for their sales. But they didn’t perform at all. Retailer developers pulled their horns in, and they spent a good deal of time figuring out where the market was going to or where they thought the market was going. The market transitioned for us from being a ‘let’s go build a grocery-anchored center in a suburban market,’ to becoming a redevelopment contactor. I would say when we look at 5 years ago, 89 percent of our work was new construction. Today, 75 percent of our work is redevelopment of some kind. It’s common for us to see an old Kroger or Kmart unit on an existing piece of property being razed and a new tenant coming in. There’s a tremendous amount of discipline amongst the retailers to ensure that they have successful properties. The second thing that’s occurred is everybody realizes there aren’t any more construction bargains. The price of construction dropped dramatically, 25 to 30 percent at its peak, and it’s not dropping any more. In fact, it’s going up. Our inputs of raw material cost, whether that be the coal-based products or cement-based products or timber-based products, are going up due to world demand. We didn’t shed a lot of muscle but we did shed some. When we look at our sub-contractor base, or supplier base, they can’t shed muscle. We also are running into the situation where people took cheap work, and they’ve run through their bank of capital. Not only are our customers asking about contracts, they are asking about performance. They are asking can this team really deliver the way you say it’s going to deliver? We like that because the idea of ‘If I just wait 6 months the price will be cheaper and I’ll still get the same performance’ is gone. The markets adjusted quickly. We’re seeing some improvement and we think things are better. SCB: We talked a little bit about the national retailers and who is active here, but it seems like there’s a lot of local retailers that are active. Do you want to address that? Coan: You could name at least 10 restaurant operators that are expanding. Some are new entrances; some like Chipotle are expanding. Twin Peaks, a new concept, is coming in pretty aggressively, looking for multiple locations. Farm Burger is opening its second location. That’s a local operator. Uttenhove: There is this focus on food, so that chef-driven concept is happening all over the place. Owners are looking to figure out ‘how do I make this more interesting’ so that you’re not in a shopping center that could be anywhere and it’s not cookie cutter. There’s a lot more interest in all kinds of local tenants. It’s still challenging. It’s difficult to get around the fact that there’s very little financing. Some developers are stepping up and figuring out how to make it happen. I feel like Atlanta is really becoming an interesting retail market. Mullice: I’d like to see Atlanta’s airport concessions impose a request to have more restaurants. There was a scoring emphasis on local restaurants. You’re going to see people like the Varsity there; it’s going to build brand. I know there was a big push on a lot of the concessionaires to sign up concepts with local folks. You’re going to have 90 million people seeing these concepts at the airport. It’s going to make their brands stronger locally and maybe in other markets. Conti: I would agree with Ray 100 percent. I just spent a week with my client and some others touring some West Coast properties trying to glean good and bad. Properties like The Domain and Santana Row. When you look at Atlanta and then you look at everything else, there’s a lot of opportunity for Atlanta in my opinion to create some cool and experiential locations; there is a void in Atlanta for some unique retailing experience. Puline: In the neighborhood centers we’re finding that the operator is often in higher demand than the turnkey restaurant. We have a lot of spaces that are basically turnkey restaurants, and if you go to a successful operator and say, ‘We want you to come into our restaurant; you don’t have to spend any money, you can open up fairly easily, all you have to do is stock it with food.’ They are going to tell you that they have 10 other opportunities to do the same thing. So that’s the real challenge is for us, in the B and C centers. We’re not going to get the groups that have five or six concepts in Midtown to come to Stone Mountain or Norcross. For us, it’s more middle America, Mexican or Chinese restaurant operator and you have to be very creative to attract those tenants. SCB: Monetha [Cobb] can you speak to your expertise in the market? Cobb: I have a different perspective than a lot of other people who represent retailers. I represent a lot of value-oriented discounters and I am here to tell you that the last 2 years have doubled the appetite for their expansion plans. Their formats have not changed. If anything, it has become more competitive in the secondary markets because all of the guys who never operated there before are backfilling junior boxes that we used to be able to readily go into. The appetite continues for them. They are well funded, well capitalized, discounters who want to continue to grow. SCB: Are they finding better locations than they were pre-recession? Cobb: Interestingly, yes, in suburbia, because that’s the availability. They are going into Target-anchored centers where they probably couldn’t before because they couldn’t afford them. In the secondary markets, it’s tough. In Savannah and Augusta, they are now competing with a much larger retail group then they had to before. SCB: In our discussion last year, it was brought up that since we haven’t had much new construction there might be some tightening of junior box space. Coan: Everybody speaks about Borders vacating retail space in this market, but in reality there’s going to be a great deal of interest for some of those boxes because they are well positioned, they were in the higher-income demographics and many of them have enough frontage that they can be divided front to back to get to smaller retailers. Cassidy Turley, who recently acquired Carter’s brokerage and property management businesses, is growing its Atlanta-based Southeast retail team led by Drew Fleming and Mark Joines. The focus in the Southeast for institutional investors, say Fleming and Joines, is on class A properties. “Specifically, credit, grocery-anchored centers are what the investment community is after right now, but we are also seeing an increase in demand for discount-oriented centers as well,” says Fleming. With Class A assets in primary markets like Atlanta either not coming to market or trading at premiums, investors are now looking at secondary markets in the Southeast as target areas for acquisitions. “Private and semi-private investors are forced, to a degree, to the secondary and tertiary markets because of the high demand that investment grade credit tenant grocery-anchored centers drive in major markets,” says Joines. Opportunistic sellers with significant equity in their properties are the ones bringing properties to market, says Fleming and Joines. Many sellers see the proceeds as a way to redeploy capital in a buyer’s market. Special servicers and lenders are the other sell-side client right now. “Across the board, the sales market is better than it was a year ago,” says Joines. Cassidy Turley has brought several grocery-anchored centers to market in secondary MSAs in the Southeast in recent weeks. The team has sold three Publix-anchored centers this year, and recently sold on a Kohl’s-anchored power center. @SEAN, Hey Sean was at palisades over the weekend chevys closed. Bravo is closing after christmas but a restaurant call yard house is replacing bravos. Yard House is in a few states and a location in yonkers. I heard I hop opened yesterday in Palisades will check it out this weekend. @rob, IHOP will be a zoo, so watch out. Yardhouse is at Ridge Hill Village, & already they have anounced that they will be opening in the Bravo space before Bravo even closes? Now that is what I call fast. I have never sene Palisades move so quickly to fill a space like that before. @SEAN, whos going to replace chevys i would suggest california pizza kitchen, pf changs.what do you think should replace chevys.They have a place openning similar to Benni Hanna Hibatchi Grill I beieve in former Fire & ICE. @rob, Good choices, but as we both know Pyramid does things differently than everyone else. Bloomingdale’s is closing this location, sadly. 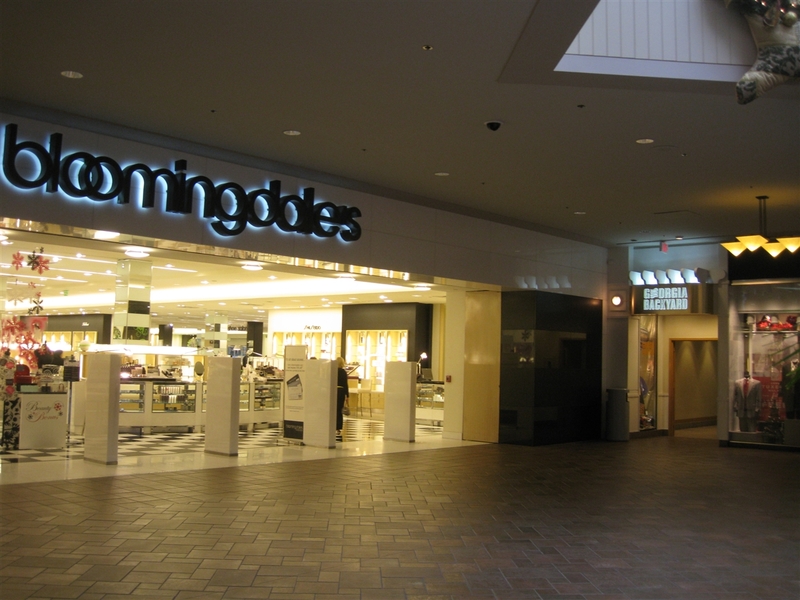 Bloomingdale’s is closing at this mall. General Growth Properties announced the addition of Von Maur department store as an anchor to Perimeter Mall, an Atlanta mall with sales of more than $550 per square foot. The department store is projected to open in fall 2012. Von Maur will replace the soon to be vacant Bloomingdale’s location. Von Maur joins a retailer line-up that also includes Apple, Nordstrom, Michael Kors, Sur La Table, and Forever 21 among many others. My first job was at Perimeter in 1980 and I worked at the mall several other times, up until 1985. It was the place to hang during the 70s/80s because there were still so few things out in that part of the city. There was also a wonderful theater building located in the parking lot. It was a tri-plex and I had my first date there. Love some of the posts on here. 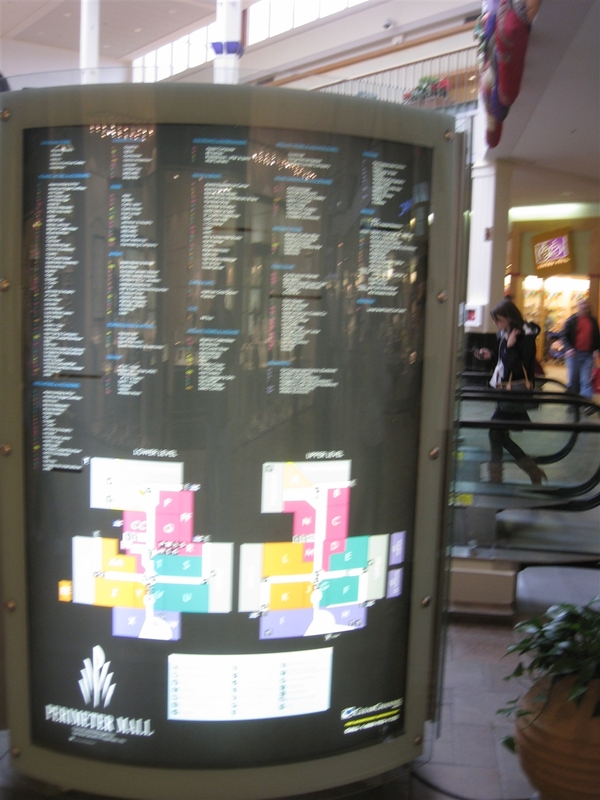 I have been trying to locate any Pics of perimeter Mall from the 70’s, I am looking for the entrance for the most part . it had a cube design that created the “P” for perimeter Mall. This was always our first stop for back to school and Christmas shopping. Great memories.